Textile workers in Bangladesh get paid as little as five pence an hour to make cheap clothes for UK companies Tesco, Asda and Primark, a report says. The mainly female workers regularly spend 80 hours per week in "potential death trap" factories, according to anti-poverty group War On Want. Tesco, Asda and Primark all strongly denied the allegations. War On Want based its report on interviews with 60 workers from six Bangladeshi garment factories. 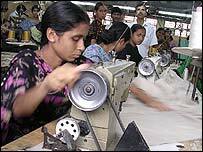 It said that starting wages at the factories were as little as £8 a month, barely one third of the living wage in Bangladesh. War On Want added that wages rose to £16 per month for better-paid sewing machine operators, but that some workers spent up to 96 hours per week in the factories without even a day a week off. It said that while Primark, Tesco and Asda had all signed up to a set of principles to provide decent working conditions and wages for workers in their supply chain, some of their suppliers were "regularly violating" such rules. "Bargain retailers such as Primark, Asda and Tesco are only able to sell at rock bottom prices in the UK because women workers in Bangladesh are being exploited," said War on Want chief executive Louise Richards. "The companies are not even living up to their own commitments towards their overseas suppliers." War On Want said it wanted UK shoppers to know what it saw as the "true costs" of clothes sold by the three retailers. A Tesco spokesman said workers at all its Bangladeshi suppliers were paid above the national minimum wage. "Tesco offers affordable clothing to UK customers - including many low-income families - but this is not achieved through poor working conditions in our suppliers' factories," he said. "All suppliers to Tesco must demonstrate that they meet our ethical standards on worker welfare, which are closely monitored." Primark said its low prices were the result of good technology, efficient distribution, bulk buying and minimal advertising. "As members of the Ethical Trading Initiative we are fully committed to the campaign to improve working standards in Bangladesh," said a Primark spokesman. Asda said it conducted 13,000 factory audits worldwide to ensure workers were not being exploited. "We want to work closely with the Bangladesh government to ensure that they take our standards as seriously as we do," an Asda spokesman said. The director general of the British Apparel and Textiles Confederation, John Wilson, told the BBC he believed British retailers were concerned about the welfare of the workers and were observing all employment laws. "Clearly the level of wages seems very low to people in this country," he said. "But if it is the minimum wage that is being paid, which I understand is about £20 a month in Bangladesh... as long as the audit is taking place at the factories, as long as all of the codes are being followed by all the people concerned - all of which I'm sure is happening in all of these cases - then at the end of the day, these are the circumstances in which these people are operating."